"Creating Opportunities to Transform Futures"
Our UNIS Hanoi Scholarship Programme is about investing in success! The success of our School, our scholars, and the future success they will bring in building a better world! Our 3-year Scholarship Fund campaign (2014-15 to 2016-17) created three new Scholarship places... thanks to our generous community! And in our 4th and final year (2017-18) we created the Dr Charles Barder Scholarship in honour of the programme's founding Head of School, which will support a series of High School scholarships for the next 10 years. Thank you! 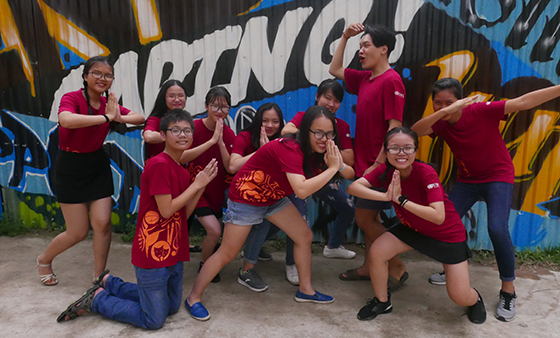 Our programme gives talented local students from disadvantaged families the opportunity to attend UNIS Hanoi for High School and transform their lives, and those they touch. Find out more about scholars on our website, but first listen to the story of our first Scholar, Nam Nguyen, who graduated in 2015. To invest in the future of Vietnam with the sincere hope that our scholars will continue to impact and inspire for the future of their country's development. When the Scholarship Programme launched the School only had budget funds to support six places. The first Scholarship Fund campaign has funded three, new, additional places with your help. Today, UNIS Hanoi celebrates eight scholars in our learning community and five alumni scholars! In four years our community has donated more than $636,000 USD. Our Annual Campaign for the The Scholarship Fund is about what we can achieve when we all work together as a community. We hope that every family will make a contribution. We hope that every teacher and staff member will make a gift. We hope that all our alumni families will join us and make a donation. Our goal is to have 100% of our families, faculty, staff and alumni make a gift to The Scholarship Fund. We hope to receive a range of gifts from 1 USD to +10,000 USD and every gift will help us achieve our goal together. Each family, each individual member of our community can make a difference. Imagine what we can achieve together! The Annual Campaign is about a community sharing a vision and everyone making their own contribution, at their own level, to achieve that goal. Only you can decide what is the right level gift for you. We welcome gifts from companies and will be actively seeking investment from companies as we build our Scholarship Fund. Please contact our Director of Advancement, Emma Silva , if you would like to make a connection to The Scholarship Fund for a corporate donation. What about gifts from people who are not UNIS Hanoi families, alumni or employees? Our primary goal is the people power of mobilizing our own direct UNIS Hanoi community, but we are happy to accept gifts from those who are inspired by the vision of our Scholarship Programme and want to contribute as a Friend of the School. We celebrate all gifts to The Scholarship Fund as philanthropic acts of generosity. What is the vision for scholarship fundraising? Our first Scholar powerfully describes the experience of learning at UNIS Hanoi as the shattering of a shell to release his potential. Education has the power to transform lives – not just individual lives but those of entire communities, and our vision for The Scholarship Fund is no less than that – to create opportunities to transform futures. To celebrate the School’s 25th Anniversary, UNIS Hanoi honored its host country by establishing a Scholarship Programme to provide a UNIS Hanoi High School education to talented Vietnamese nationals from low income families. The School can only resource a very limited number of Scholarships through its budget and the programme is at capacity with six full tuition scholarships. Our ambitions for the Scholarship Programme go beyond budget. The goal for our fundraising is to expand our Programme through our community’s direct generous support. We have generated community-wide contributions to increase our programme by 50% and create three additional scholarships, creating opportunities to transform futures that will keep on giving. Our continued fundraising will support the sustainability of those scholarships. Meaningful change starts with small steps, one life at a time, one year at a time. What is the UNIS Hanoi Scholarship Programme? The UNIS Hanoi Scholarship Programme gives the opportunity for talented Vietnamese students from low income families, who are excelling at their local Hanoi district school to enter UNIS Hanoi with a full (100%) fees waiver until graduation. 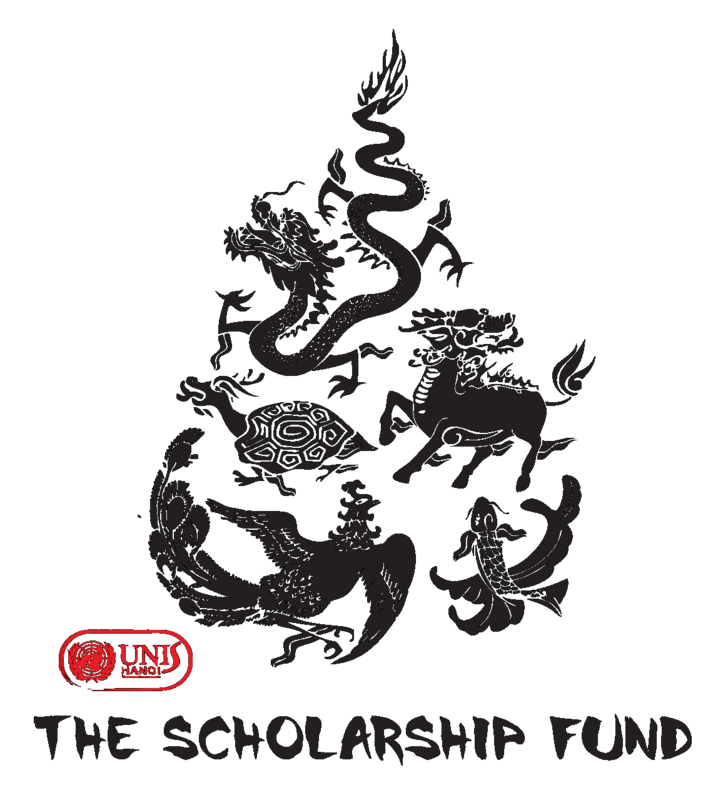 Students may apply to the UNIS Hanoi Scholarship Programme for entry to Grade 8, Grade 9 or Grade 10. In all cases, the 100% Scholarship is valid until their graduation from UNIS Hanoi. All external exam (PSAT/SAT) and university application fees. For more detailed information about the Scholarship Programme please refer to our website. The programme is too young to be measured by any meaningful metrics, we can only share the stories of our young scholars in their own words and from the teachers who work with them. We are proud of our Scholars and of their commitment, hard work and joyful talent which has enriched all those around them. The Programme graduated its first Scholar in June 2015. We now have four alumni scholars, all of whom have been offered 100% tertiary education scholarships in USA, UAE and Japan. UNIS Hanoi is excited to watch how both each Scholar’s individual future is shaped, and how they will shape the future of others and this world. How willl we achieve vision? To create new Scholarships through a community-wide Annual Campaign. A four-year scholarship is currently valued at $150,000. To build a sustainable fund and to ensure the future our three new Scholarships. Both goals will be achieved through gifts from the UNIS Hanoi community; parents, faculty, alumni and corporate partners. We know that meaningful change starts with small steps and this year we start a journey together – one life at a time – one year at a time. All community gifts, large and small, will be used to create our new Scholarships and 100% of every gift will be used to create opportunities to transform futures. How can you support the Programme? We hope that every member of our community will be inspired to support the opportunity for change that the Scholarship Programme represents and make a gift to help transform a future. Every gift counts and although our long term vision is ambitious, we know that no gift is too small in helping to achieve our goals, both year on year and for the future. You can make gifts online and US taxpayers can receive a benefit by giving through our partner, Give2Asia. All gifts will be reported in the Annual Report (unless anonymity is requested). At the same time as our Community Campaign, we will be seeking transformational gifts from community members to build our Founders Fund which provide ongoing security for the future of our new scholarships. Naming rights are attached to Founders Fund gifts which fully fund a scholarship. All gifts will be celebrated through a gift recognition wall. How will the Fund be distributed & reported? A Scholarship will only be awarded when there are sufficient funds for the full duration of the Scholarship – Four Years. Our new community funded scholars will be selected through the same process as the current budgeted scholarships, but with special attention to those who demonstrate a sincere personal goal of giving back to their home country. All fundraising and distribution will be reported in the School’s Annual Report and will be featured on the School website. Why fundraise for this Programme? UNIS Hanoi is a fiscally responsible institution, but it does not have surplus reserves to fund additional Scholarships, nor does it wish to increase tuition fees more than inflation and its core business requires. As a not-for-profit institution, all tuition fees are invested directly in providing the highest quality education and inquiry based learning environment for all our students. UNIS Hanoi receives no support from government or UN agencies. With no shareholders or proprietor to reward with profits, our students are the only beneficiaries of income to UNIS Hanoi. In order to continue to strive for excellence without relying solely on tuition UNIS Hanoi is committed to institutional fundraising in support of the School’s Mission and to fulfill the School’s Vision. The Scholarship Fund will support our ambition and vision to expand our successful Scholarship Programme without tuition fee increases.